‘Umar al-Khayyam (better known as Omar Khayyam, 1048-1123 CE), was a polymath scholar from Nishapur, Persia. Mathematician, philosopher, astronomer and poet, he also wrote treatises in Arabic on mechanics, geography, music and physics. Because of the originality of his contributions, Al-Khayyam was established as one of the major mathematicians and astronomers of the Islamic scientific tradition. Al-Khayyam was born in Nishapur, Khurasan on 18 May 1048. In the following article, we survey his work and celebrate his anniversary. Abū'l-Fath Ghiyāth al-Dīn ‘Umar ibn Ibrāhīm al-Khayyāmī al-Nīshāpūrī (born in Nīshāpūr, Khurāsān, 18 May 1048 - died in Nīshāpūr, circa 1123), known as Al-Khayyām was one of the greatest mathematicians and astronomers of the Islamic scientific tradition, and a great poet, author of the famous philosophical quatrains (rubā'īyāt). His algebra contains geometric and algebraic solutions of equations of the second degree; an admirable classification of equations, including the cubic ones; a systematic attempt to solve them all, and partial geometric solutions of most of them. Khayyām was born in or near Nīshābūr to a family of artisans (Al-Khayyām = tent maker). Most of his primary education took place in Balkh and Nīshābūr. He also worked in Samarkand (Bukhara) and Isfahan. When he was in Samarkand, a high ranking official Abū Tāhir took him under his supervision. In 1892, a club with the name of Khayyām was founded in London; in 1970 one of the craters of the Moon was named after him, and in 1980 a newly invented cone in mathematics was given his name. In 1934, a monument to Khayyām was erected on his tomb in Nīshābūr. Figure 1: ‘Umar Khayyām's statue. (Source). Khayyām's poetic genius was always celebrated in the East, but his fame in European countries is of rather recent origin. In the West he is one of the most well-known and admired eastern poets and scholars. In 1859, a few years after Woepcke's edition had made Khayyām's algebra — previously almost unknown — available to Western scholars, the English poet Edward Fitzgerald published translations of seventy-five of the quatrains, an edition that still remains popular. Many more of the poems have been published in a number of European languages. The poems generally known as Khayyām's rubā'īyāt are one of the summits of philosophical poetry, displaying an atheistic free thought, humanism and aspirations for justice, irony and scepticism. Khayyām exerted a great influence over scholars in the West and East. In the fields of mathematics, his works were not surpassed in Islamic mathematics until Sharaf al-Dīn al-Tūsī (d. 1213) and in the West until Descartes (d. 1650), who preferred the geometric methods for the solutions of third degree equations. Khayyām was also a physician. He treated Berkyaruk, Muhammad and Sanjar, the sons of Malik Shāh. He was also accepted as a follower of Ibn Sīnā's (c. 980-1037) ideas and studied physics and medicine, and worked on music. Around 1070, Khayyām reached Samarkand, where he obtained the support of the Chief Judge Abū Tāhir, under whose patronage he wrote his great algebraical treatise on cubic equations, the Risāla, which he had planned long before. A supplement to this work was written either at the court of Shams al-Muluk, khaqan of Bukhara, or at Isfahan. In 1074-75, Khayyām was invited to the capital city of Isfahan by the Seljuk Sultān Jalāl al-Dawla Malik-shāh (1072-1092) to organize an astronomical observatory at Isfahān and reform the old Persian solar calendar, which had been replaced by the Hegira calendar. This reform was completed on 10th Ramadān 471/16 March 1079 and the new calendar, with 8 leap years over 33 years, was called al-Ta'rīkh al-Jalālī (Jalālī era) or Ta'rīkh-i Malikī (Maliki era), both names being derived from the names of the Malik Shāh and Jalāl al-Dawla. Khayyām's calendar was very accurate, probably more so than the Gregorian calendar (which leads to an error of 1 day in 3,330 years). This calendar with an error of only one day in a cycle of 5000 years was adopted by royal decree. Figure 2: Page of a manuscript on the mathematics of cubic equations by Khayyām. (Source). Although he himself did not believe in judicial astrology, Khayyām also served as astrologer, at the court of Sultān Sanjar (1118–1157). He stayed at Isfahan for almost eighteen years, which were probably the quietest and most scientifically fruitful years of his life. The best astronomers of the time were gathered at the observatory and there, under Khayyām's guidance, they compiled the Zīj Mālik-shāhī (Malik-shah Astronomical Tables). In 1092, Khayyām lost his stable position when Malik-Shāh passed away and his vizier Nizām al-Mulk was murdered. He also lost all financial support for his work at the observatory and his incomplete calendar work. He then left Isfahan during the reign of Malik-shah's third son Sanjar, who had ascended the throne in 1118, and returned to Khurāsān spending the rest of his life in Marw and Nīshāpūr. The main contributions by Khayyām in science are related to mathematics and astronomy. 'Abd al-Rahmān al-Khāzinī in his Kitāb Mīzān al-hikma, which he composed in 515/1121, often mentions Khayyām for his scientific works. The Rubā'īyāt (quatrains): Khayyām's philosophical rubā'īyāt, his most well-known work, have become, especially since 1859, when Edward Fitzgerald published the first instalment of his English paraphrase (The Rubaiyat of Omar Khayyam), one of the most popular classics of world literature. Fitzgerald's first edition (London, 1859), contained only 75 quatrains. The French translation by J. B. Nicolas (Les quatrains de Khèyam) appeared in Paris in 1867, and was soon followed by Fitzgerald's second edition in 1868. In 1882, Edward Henry Whinfield edited a new translation of 253 quatrains, and in 1885, of 500, together with the Persian text. This translation is less poetical but more scholarly than Fitzgerald's. Risāla fī taksīm rub' al-dā'ira (Treatise on the Subdivision of the Quadrant of a Circle): The complete theory of cubic equations was set forth by Khayyām in this Arabic treatise which was written in Samarkand and dedicated to the Judge Abū Tāhir. This treatise contains the complete classification of linear, quadratic, and cubic equations with positive roots, the classification of cubic equations, solution of the equation x3 + 200x = 20x2+ 2000 by intersection of a circle and an equilateral hyperbola and approximate numeric solution of the equation. Khayyām found also the approximate numerical solution of this equation. This treatise was translated into various languages. Risāla fī'l-barāhīn ‘alā masā'il al-jabr wa'l-muqābala (Treatise on Proofs of Problems of Algebra): This is a treatise of the solution of cubic equations; classification of linear, quadratic, and cubic equations with positive coefficients and solution of each type of cubic equations by intersection of a circle, a parabola, and equilateral hyperbolas; investigation of the possibility of positive roots and their multiples. The treatise was written in Samarkand after Risāla fī taksīm rub' al-dā'ira and has an appendix written five years later on an error of Abu 'l-Jūd. Risāla fī Sharhi mā ashkala min musādarāt Kitāb Uqlīdis (Commentary on Difficulties in the Postulates of the Book of Euclid): This treatise of Khayyām's consisting of the commentaries on Euclid's theory of parallel lines and theory of ratios, was completed at Isfahān in 469/1077. Together with his earlier algebraical Risāla, it is his most important scientific contribution. 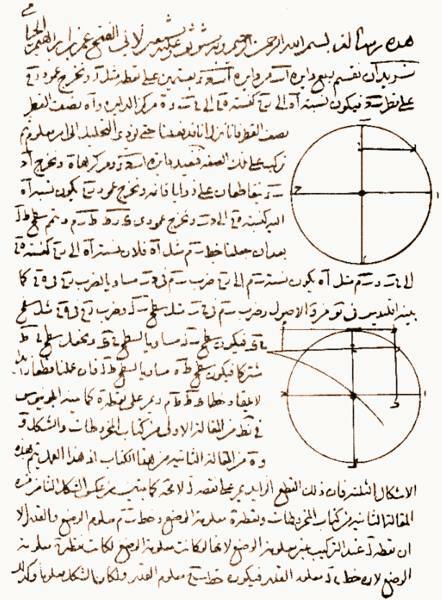 The treatise consists of three chapters and an introduction containing the critique of the application by Euclid and Ibn al-Haytham of motion in geometry. The three parts of the treatise are devoted to the postulate on parallel lines, the theory of ratios, and the theory of compound ratios. An important part of the book is concerned with Euclid's famous parallel postulate, which had previously attracted the interest of Thabit ibn Qurra and Ibn Al-Haytham. 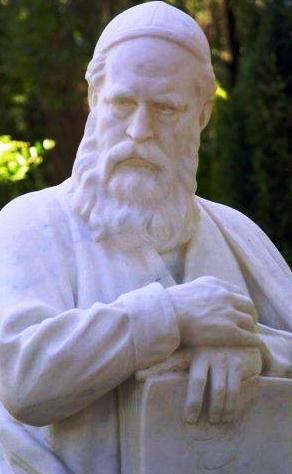 Khayyam's attempt was a distinct advance, and his criticisms made their way to Europe, and may have contributed to the eventual development of non-Euclidean geometry. Mushkilāt al-Hisāb (Difficult Problems of Arithmetic): In this treatise, Khayyām deals with the proof of the Indian methods of extraction of square and cube roots and the extension of these methods for bases of quadrato-square, quadrato-cube, and so on. The untitled treatise: Discovered in the 1960s, the treatise is about a problem for which the author offered a variety of solutions: a cubic equation, two geometric constructions by means of conic sections, and a numerical interpolation in trigonometric tables. This problem appeared to be of particular interest to Khayyām as he wrote a whole essay on it. It is of critical importance to the history of mathematics as it motivated the author to make major contributions to algebra and number theory. It is also of great significance to the history of Islamic art and architecture as it becomes the evidence of Khayyām's involvement in the ornamental arts, and thus indicates his familiarity with the problems related to architecture. Alpay Ozdural published a study regarding this treatise: "‘Umar Khayyām, Mathematicians, and "Conversazioni" with Artisans," in The Journal of the Society of Architectural Historians, Vol. 54, No. 1, (Mar., 1995), pp. 54-71. Nawrūz-nāma (Book of the New Year, in Persian): A treatise on calendars and especially on the calendar reform of the Iranian Solar Calendar and on New Year festival ceremonies in pre-Islamic Iran. This treatise was written after the destruction of Khayyām's astronomical observatory in Isfahan and its aim was to draw the attention to calendar reforms and to prompt the rulers to restore the observatory. Al-Zīj Malik-shāhī (Astronomical tables for Malik Shāh): This treatise contains the results of his own observations in the observatory which he founded. Of this work only a small portion — tables of ecliptic coordinates and of the magnitudes of the 100 brightest fixed stars — survives. Al-Khāzinī's "Balance of wisdom" contains the texts of two of Khayyām's treatises on mechanics Mīzān al-hikam and Fī al-Qistās al-mustaqīm. Both are devoted to the theory of the level and hydrostatic balances. Mīzān al-hikam fī ihtiyāli ma'rifati miqdāray al-dahab wa al-fidda fi jismin murakkabin minhumā (The Ingenious way for determining gold and silver in a body composed of them): about determining the quantities of gold and silver in an alloy by weighing in the air and water. The text gives a purely algebraic solution to the problem. It was completed by Khayyām's pupil 'Abd al-Rahmān al-Khāzinī. Fī al-Qistās al-mustaqīm (on the right balance): This is included in the "Book on Balance of Wisdom" by al-Khāzinī. It is a treatise on a hydrostatic scale balance with a movable weight which was invented by Khayyām. Mohammed Abattouy published an article about this text: "Al-Qistas al-mustaqim: la balance droite de ‘Umar Khayyām." Farhang. Quarterly Journal of Humanities and Cultural Studies (Tehran, Iran). Issue Topic: Commemoration of Khayyām (3), vol. 18, n 53-54, 2005: pp. 155-166. Al-Qawl ‘alā al-adjnās allatī bi'l-arba'a (Reasoning on kinds [formed] by quarts): This is a treatise about musicology, perhaps a fragment of the manuscript which is mentioned in the treatise of Khayyām on geometry. Khayyām applied arithmetic, particularly the theory of commensurable ratios in this text. Sharh al-mushkīl min Kitāb al-Mūsiqā (Commentary on Difficulties from the "Book on Music"). Lawazīm al-amkina (Necessary information on places). Mukhtasar fi'l-tabi'iyāt (Concise [Treatise] on Nature), mentioned by Swami Govinda Tirtha with reference to the book of al-Bayhaqī. Although Khayyām wrote five specifically philosophical treatises, and although much of his poetry is of a philosophical nature, it remains difficult to ascertain what his world view might have been. The problem is complicated by the consideration that the philosophical tracts differ from the quatrains, while analysis of the quatrains themselves is complicated by questions of their individual authenticity. It might also be speculated that Khayyām wrote his formal philosophical works to clear his name of the accusation of freethinking. Abū Nasr Muhammad al-Nasawī, the judge and imam of the province of Fars, and also a pupil of Ibn Sīnā, asked Khayyām to write some of the texts described below to defend himself from heresy. It is possible that al-Nasawī wanted to defend Khayyām against these accusations. Khayyām's philosophy is hardly original, his most interesting works being those concerned with the analysis of the problem of existence of general concepts. Risālat Al-Kawn wa al-taklīf (Treatise on Being and obligation): Written in 472/1080 at the request of al-Nasawī. This request may possibly be explained by the contents of some quatrains composed by Khayyām or ascribed to him, and the judge, as a pupil of Ibn Sīnā, wanted to free Khayyām from suspicions of heresy. Djawāb ‘an thālath masā'il: darūrat al-tadādd fī 'l-ālam wa'l-djabr wa'l-baqā' (Answer to three questions: Necessity of contradiction in the World, Determinism, and Longevity). This treatise is connected with the previous treatise. It deals with three new and more difficult questions proposed to Khayyām by Al-Nasawī. Al-Ziyā' al-'aqli fī mawdū' al-'ilm al-kullī (The Light of reason on the subject the Universal Science): This is his third philosophical text in Arabic. Risāla fī al-wudjūd (Treatise on Existence): Khayyām's fourth philosophical treatise, also in Arabic, written about 1080, for a son of Mu'ayyid al-Mulk (vizier in 1095-1118). His fifth philosophical treatise is written in Persian. These manuscripts have three titles: Risāla fī kulliyāt al-wujūd (Treatise on the universality of Existence) = Darkhwāst-nāma (Book by Demand) = Risāla-yi silsila al-tartīb (Treatise on the Chain of Order). It is about the cosmology of Ibn Sīnā and al-Fārābī and comprises four chapters. It was written for the son of Mu'ayyid al-Mulk, vizier to the later Selj_ūks, and contains a detailed exposition of Ibn Sīnā's theory of "chain of order": the links of this chain are connected with celestial spheres; each link has a mind and soul, and is moved by activity and love. Abattouy, Mohammed. "Al-Muzaffar al-Isfizārī ‘ālim min al-qarnayn 5-6 H/11-12, mu'allif Irshād dhawī al-'irfān ilā sinā'at al-qaffān". In Antiquite et moyen age. Rabat: Publications de la Faculte des Lettres, 2000, pp. 135-175. Abattouy, Mohammed. "Greek Mechanics in Arabic Context: Thābit ibn Qurra, al-Isfizārī and the Arabic Traditions of Aristotelian and Euclidean Mechanics". Science in Context (Cambridge University Press), 2001, vol. 14: pp. 179-247. Abattouy, Mohammed. "La Tradition arabe de la balance: Thābit Ibn Qurra et al-Khāzinī". In Quelques aspects de l'evolution des idees scientifiques. Antiquite et moyen age. Rabat: Publications de la Faculté des Lettres, 2000, pp. 49-91. Amir-Moéz, Ali R. "Discussions of Difficulties in Euclid," Scripta Mathematica 24 (1959): 275-303. Arberry, A. J. The Rubā'īyāt of Omar Khayyām, edited from a newly discovered manuscript dated 658 (1259-60) in the possession of A. Chester Beatty Esq., with comparative English versions by Edward Fitzgerald, E. H. Whinfield and the Editor, London 1949. Brockelmann, C. Geschichte der arabischen Literatur, I (Weimar, 1898), 471; supp. (Leiden, 1936), 855-856; III (Leiden, 1943), 620-621. A complete list of all Arabic MSS and their eds. known to European scientists; supp. vols. mention MSS and eds. that appeared after the main body of the work was published. Hashemipour, Behnaz. "Khayyām: Ghiyāth al-Dīn Abū al-Fath _Umar ibn Ibrāhīm al-Khayyāmī al-Nīshāpūrī". Biographical Encyclopedia of Astronomers, edited by Thomas Hockey, volume II, pp. 627-628. Kasir, D.S. The Algebra of Omar Khayyām, New York, 1931. Lazard, G. Omar Khayyām. Cent un quatrains, traduction du persan, Paris, 1997. Nadwī, S. S. 'Umar Khayyām, 'Azamgarh, 1932. Omar Khayyām, Treatises, Arabic and Persian texts, and Russian tr. Rosenfeld, Moscow 1962. Potter, A.G. A bibliography of the Rubāiyāt of Omar Khayyām. Together with kindred matter in prose and verse pertaining thereto. Collected and arranged by..., London 1929, repr. 1994. Rashed, R and Djebbar, A. L'oeuvre algébrique d'al-Khayyām, Aleppo, 1981. Rashed, Roshdi & Vahabzadeh, Bijan. Al-Khayyām mathématicien. Paris: Blanchard (2 parts: Geometrical Theory of Algebraic Equations, Theory of Parallels and Theory of Proportion); English translation: Omar Khayyām the Mathematician. New York: Bibliotheca Persica Press, 2000. Rosenfeld, Boris A. and Ihsanoglu, Ekmeleddin. Mathematicians, Astronomers and Other Scholars of Islamic Civilization and their Works (7th-19th), ed. E. Ihsanoglu), Istanbul: IRCICA, 2003, no. 420. Rosenfeld, B. A. and A. P. Youschkevitch. Omar Khayyam (Moscow, 1965), consisting of a biographical essay, analysis of scientific (especially mathematical) works, and detailed bibliography. Rosenfeld, Boris A. (2000). "Umar Khayyām." In Encyclopaedia of Islam, 2nd ed., Vol. 10, pp. 827–834. Leiden: E. J. Brill. Sarton, George. Introduction to the History of Science, vol. 1, Baltimore, 1927, pp. 759-761. Sayili, Aydin. The Observatory in Islam and its place in the general history of the observatory. Ankara: TTK, 1988, 160-164. Struik, D. J. "Omar Khayyam, Mathematician," in Mathematical Teacher, no. 4 (1958), 280-285. Suter, H. Die Mathematiker und Astronomen der Araber und ihre Werke, (Leipzig, 1900, pp. 112-113. Woepcke, F. L'Algebre d'Omar Alkhayyāmī, Paris, 1851. Youschkevitch, A.P., and B. A. Rosenfeld. Al-Khayyāmī (or Khayyām), in Dictionary of Scientific Biography, New York: Princeton University, 1973, VII, 323-34.